Looked at from overseas, the past decade of Australian political history might appear almost recklessly self-indulgent. How could a country boasting 27 years of uninterrupted economic growth also witness no fewer than six changes of prime minister since 2007? This toxic cocktail of ego, impatience and poisonous ideological rivalry has consumed both sides of politics and swung its own wrecking ball through a swathe of much-needed domestic reforms. Its impact on Australia’s place in the world has been much less discussed. In part, this is because—despite all the turbulence—the country is drawn towards bipartisanship on foreign and defence policy. There is most certainly variance in tone and nuance between the major parties, especially on Australia’s China policy, but if the Labor Party wins office at next year’s election, the differences in policy will be largely of degree rather than of kind. Given new prime minister Scott Morrison’s domestic preoccupations—healing the governing Liberal Party, lowering energy prices and above all getting re-elected—he can do little but keep Australian foreign policy in something of a holding pattern. 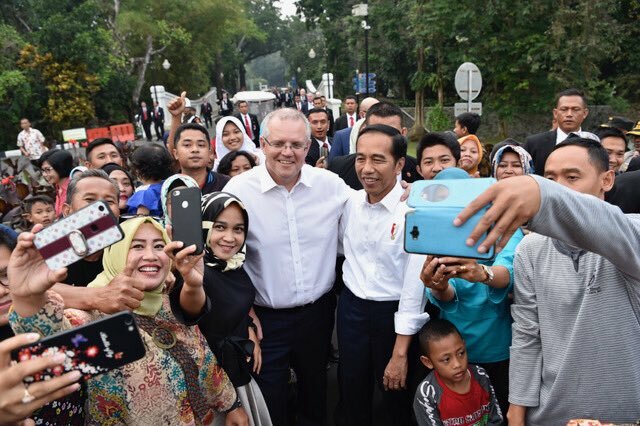 Other than an Australian presence at regional summits and Morrison’s signing off on deals already in the works, such as the recent Indonesia–Australia Comprehensive Economic Partnership Agreement, it is most unlikely that the next six months will see any major foreign policy initiatives from Canberra. It takes some time for a new prime minister and his cabinet to get their heads around the range and complexity of international issues on Australia’s strategic plate, and the latest batch of ministers will simply not have that luxury. The problem with an Australian foreign policy in suspension is that the same lack of imagination and daring that was shown in the last government’s approach may well define this one’s too. Previous prime minister Malcolm Turnbull and his national security team had barely begun the hard task of revisiting the assumptions that have for so long dominated Australian foreign policy thinking. No white paper, even one as carefully crafted as that released late last year, can endure as some kind of canon for the nation’s approach to the world. To critique the Turnbull government in this way, or indeed those governments that preceded it, is not to lament the absence of a ‘grand strategy’ coming out of Canberra. Such a term does not easily fit the historical pattern of Australia’s global engagement; rather, the core dynamic in Australian foreign policy has been the often fraught but also creative tension between its western European heritage and its geopolitical location in Asia. China’s rise and America’s unpredictability are now the major—if not the only—pressures bearing on this dynamic. It is also too often forgotten that Australia has endured previous bouts of political instability. From the January 1966 retirement of Robert Menzies until the December 1972 election of the Whitlam Labor Party government, three prime ministers in relatively quick succession—Harold Holt, John Gorton and William McMahon—all wrestled with the challenges of a rapidly changing international environment. Though this period is often dismissed as one of ‘dither’ in Australian foreign and defence policy, these leaders encountered the virtual collapse of Australia’s Cold War policy—namely the desire to keep the United States and the United Kingdom engaged in Southeast Asia. As the UK headed off into Europe and withdrew its military from the region, the US was recalibrating its own Asian posture as Vietnam continued to sour. The speeches of these leaders were littered with the lexicon of uncertainty and anxiety as a new more multipolar world started to wear down bipolar rigidity, forcing Australia to look at its region anew. As journalist Donald Horne wrote at the time, the leaders of that generation were ‘running in a maze. A world had withered’. Today’s challenges are in their own league. But one feature of the previous era may be worth bearing in mind: the political turmoil which engulfed the post-Menzies Liberal Party left virtually no time for its leaders to revise their fixed Cold War assumptions. They had the inclination neither to think anew about China nor to reassess their fears about the ‘red peril’, and as a consequence they missed the signs coming out of Washington in the mid-1960s that America’s China policy was to undergo a profound metamorphosis. The result was paralysis and flat-footed diplomacy. With the erratic President Donald Trump in the White House, now is not the time for Australia to be averting its gaze from the world. Nor is it the time to recycle the rhetoric of ‘mateship’ as if the very repetition of the word will weave magic in Washington: Trump has shown he can turn on a dime. In a period of relative American decline, the new Morrison government should give top priority to articulating a clearer narrative on the imperative for greater engagement between Australia and the major Asian powers, conscious of the tricky terrain between economic interdependence and strategic rivalry. In his recent book Has the West lost it? Kishore Mahbubani warns that ‘the shortcomings of democracy are dominating Western societies at a time when these societies have to make major strategic changes’. Australia is likely to keep its balance, but the great tragedy of a revolving prime ministerial door is that it once more delays the task of coming to terms with the scale of the geopolitical transition taking place in Australia’s backyard and the wider world. James Curran is a professor of modern history at Sydney University. A version of this post was originally published on the East Asia Forum; it has been republished with kind permission. Image courtesy of Scott Morrison on Twitter.